Usually a duo, the Easy Leaves appear as a full band for this concert. The Easy Leaves’ debut album, American Times, is most definitely country music, but it’s colored and enriched by many thoroughly integrated influences. The Leaves’ harmonies are resplendent with echoes of the great “brother” acts of country music: The Louvins, Everlys, and Glasers. The chugging locomotion of opener “Get Down” could almost be a cousin of Johnny Cash’s “Folsom Prison Blues,” but the merrily debauched lyrics betray the good-time inspiration of the Dead’s and New Riders’ cosmic cowboy ethos of the late Sixties and early Seventies. The mid-tempo sunshine of “Fool on a String” reflects a strong mid-1960s R&B influence, and the loping, amiably ominous “Better Get Off” could have come from Dylan & The Band’s Basement Tapes collection. 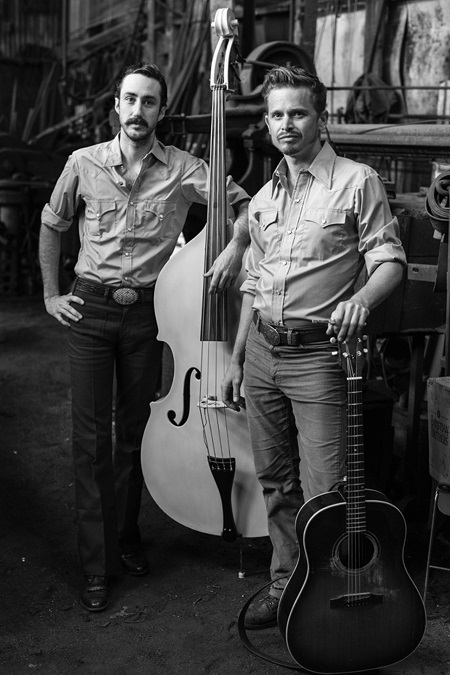 The Easy Leaves have toured as a duo and as part of a full band. For their upcoming show at the Great American Music Hall, Carducci said, “We’ll be performing with a five-piece lineup, with Vicente Rodriguez on drums, Dave Zirbel on [electric] Telecaster [guitar], and Josh Yenne on pedal steel.” Without a hint of compromise, The Easy Leaves’ inclusive-yet-very-personal approach holds much appeal for fans of Steve Earle, Whiskeytown, The Avett Brothers, and Brad Paisley.